Although it almost never snows where we live, it does get quite cold here. 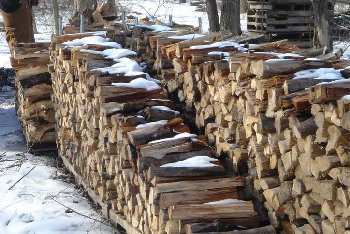 So one of our ever-present homestead chores is cutting, splitting and stacking firewood for the winter months. We have 2 woodstoves, a fire pit and a wood-fired pizza oven to feed! A hydraulic wood splitter is quite expensive, and so you might want to just rent one once a year to split all your firewood. We decided to go on and buy one because we live inside a National Forest and we harvest "dead-and-down" forest trees year-round, on an ongoing basis. So we have a fantastic gas-powered monster that we just love, and will tell you all about her later on in this page. 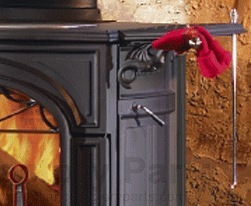 Our barn woodstove in action, toasty warm and graceful. I bought one of these wood stoves for my new barn/workshop, and boy do I love it! It's a newer-generation hi-tech woodstove that is incredibly efficient. It "recycles" gases due to a "double burn", which makes it very conservative on wood use. I keep this thing burning all day long on cold days by just occasionally dropping a small log or two into the convenient top hatch. I also like the swing-out ash tray at the bottom, which can be emptied out even while the stove is still burning! You can burn with doors open if desired, by placing optional spark screen in front. We also bought the two "side wings", or warming shelves with four mitten racks/shoe dryers. 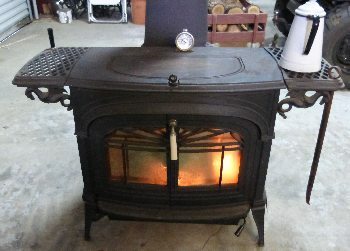 This woodstove is also very easy to light up, elegant in appearance and adds some class to an otherwise "casual" shop. 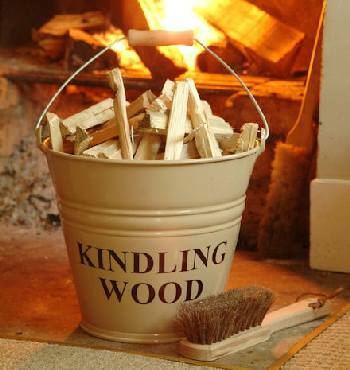 Splitting off small fire logs into kindling (small sticks for fire starting) can be dangerous. It normally entails holding the log upright with one hand, then striking down the center of the log with a sharp axe. It takes a bit of sleight-of-hand to avoid cutting your hand with the axe. Enter the "Kindling Cracker Firewood Kindling Splitter". This clever device was the brainchild of a school-age kid in Australia. She came up with a safer, faster and easier way to split kindling, and actually won a Science Fair with her design. The Kindling Splitter is now manufactured in an Australian Foundry of top-grade cast iron. Sturdy, maintenance-free, and amazingly easy to use; with this cool tool, you can say goodbye to your sharp axe blade! We'll tell you how you can make Scott's homemade wood splitter below. But first we wanted to show you the Mac-Daddy Hydraulic Log Splitter we also couldn't live without. 1- Metal base, he had a steel plate 8.5" x 8.5". You can also use diamond plate, angle iron, etc. He used a mig welder to weld both ends of each rebar and the axe head to the steel base plate. Then he welded the steel ring to the other 2 ends of the rebar. He found it worked much better once he bolted it down securely to a very heavy wood base. It bounced around too much otherwise. He estimates if he had to go out and buy the supplies, it would have cost between $15-$20. Read all about some of our other Homestead Projects; like a weather station, insect repellers that work and a for-real squirrel-proof bird feeder. Discover how you can start your own Backyard Homestead with very little or no land.